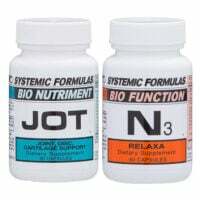 The top product in my clinic for tension, anxiety and general pain relief. All natural, chemical free, non-toxic formula for the support of pain relief and tension. 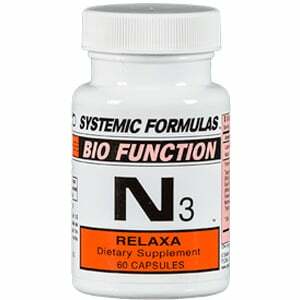 Systemic Formulas N3 – Relaxa is a proven formula used for more than 40 years. Non habit forming. May help alleviate any drug dependence (sleeping pills, chemical tranquilizers). 1/2 to 3 capsules up to twice a day anytime. 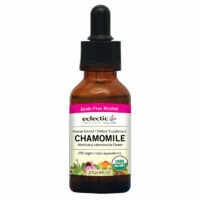 This product contains vitamins and calming herbs for stress, pain and sleep. Take it day or night, with or without food. 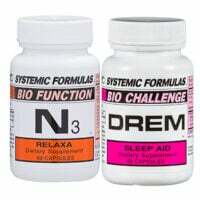 This product causes drowsiness but one capsule will not put you to sleep. Excellent paired with our Passion Flower drops in Glycerin or in Alcohol and with the Systemic Formula DReM Sleep Aid. The N3 – Relaxa capsule can be opened if less than a full capsule is desired. It has a bitter taste but can be taken with a bite of food to calm kids and the elderly or those who don’t like pills. Niacin; Tayuya; Blue Vervain; Valerian Root Extract; Senna Leaves; dL-Methionine; Kola Nuts; Passion Flower Extract; Calcium Chelate; Saw Palmetto; Sete Sangrias; Yarrow; Mandrake Root; Mormon Tea; Tyrosine Tryptophan; Lobelia.